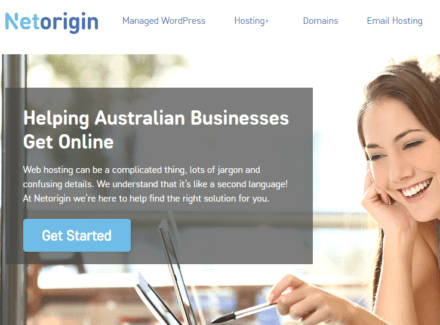 NetOrigin is a Perth-based hosting company that offers shared and VPS packages to suit all kinds of users. Their shared hosting plans are relatively affordable, and they have a high-performance variant specifically designed for e-commerce business owners. Both types of plan come with standard features like cPanel and one-click web application installers, but NetOrigin goes a step further by giving you the CloudFlare CDN, Railgun acceleration, an SSL certificate, and nightly backups, all free of charge. NetOrigin's VPS hosting offers slightly less value, with most features requiring extra fees, but you'll still get a rock-solid 99.95% uptime guarantee and flexible billing cycle options. NetOrigin gives you two affordable shared hosting plans to start with, with fairly generous resource allocations for the price. Whichever package you choose, you’re sure to get good value, especially considering the great bonuses that NetOrigin includes. Both plans use SSD storage for snappy performance, and you get unlimited email and MySQL databases. You’ve also got staple features like cPanel and one-click installers for over 170 popular web applications (including WordPress and ZenCart, among others). NetOrigin sweetens the deal further by including the CloudFlare CDN (content distribution network) and Railgun accelerator tools for free, so you get boosted page loading times and tighter site security. Add to that the Let’s Encrypt SSL certificate and the nightly backups that come free with both plans, and you’re looking at a lot of great and useful features that would normally cost you extra charges elsewhere. If you’re mostly focused on building a robust online business, check out NetOrigin’s High-Performance plan instead. This is built specifically for e-commerce, with special features designed to eliminate factors such as site lag and unsecure portals that could chase away potential customers. You’ll get 25 GB of SSD storage, but more than that, NetOrigin gives you unlimited bandwidth to handle a boatload of visitors and transactions if needed. There’s the free cPanel software too, so you can manage your account and domain easily; bear in mind, though, that this plan only lets you host one website, so if you’re thinking of building a more complex e-commerce network, this is not the plan for you. That said, customers are likely to abandon their shopping carts if pages take too long to load or experience frequent hiccups, so NetOrigin does everything it can to keep that from happening. You’ll get accelerated page loading times and enhanced security through the free CloudFlare CDN (content distribution network) and Railgun accelerator. Just to be safe, NetOrigin also throws in the Litemage Page and OptimumCache tools for even faster content loading times. You’ll also get one dedicated IP address and a Free Let’s Encrypt SSL certificate, to ensure your visitors’ security and boost your website’s overall perceived trustworthiness. Spam filtering keeps junk out of your email, and nightly offsite backups with free restores mean you don’t have to worry about devastating data losses. Unlike other hosting providers, though, NetOrigin doesn’t give you the option to use Windows operating systems for your VPS. Nevertheless, you can take your pick from a number of Linux distributions: CentOS, Debian, Ubuntu, and Fedora. All VPS packages are self-managed, so these are better suited for those who are confident in their server management and maintenance skills. You can also customize your chosen package’s specifications; you can boost your virtual CPU up to a maximum of 6 cores ($35.96), for example, while RAM can go as high as 8 GB ($49.95). You can also have a maximum of 10 dedicated IP addresses ($35.91). NetOrigin gives you free setup for each plan, plus free migration for any websites and cPanel accounts you might already have. NetOrigin also gives you excellent uptime guarantees: standard 99.9% uptime for their web hosting plans, and rock-solid 99.95% uptime for their High Performance and VPS hosting plans. As for your payment terms, you’re free to choose from monthly, quarterly, annual, biennial, or triennial billing cycles. NetOrigin also has a 30-day money-back guarantee, so you can try out the company’s services first, with the assurance of a full refund if you decide to cancel your account within 30 days of registration. You can request customer support from NetOrigin 24/7 through email and support ticket. Phone support is also available during weekday operating hours. The company’s knowledgebase houses a small collection of guides and answers to frequently asked questions, too. What's the Verdict on NetOrigin? Oveall, NetOrigin’s shared hosting plans are pretty good deals, especially because of the wealth of convenient bonus features that you get. The CloudFlare CDN and Railgun accelerator combo drastically ramp up your site’s loading times, while you save on essential security options with the free SSL certificate and data backups. The VPS hosting plans are less of a steal due to the extra charges for staples like cPanel, but overall, NetOrigin is a solid choice.